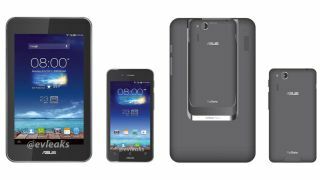 Getting in ahead of the CES 2014 chaos, Asus has launched its 7-inch PadFone Mini in Taiwan. The two-in-one device – both phone and tablet – is a cheaper option to the PadFone Infinity and comes running Android 4.3. It's also the very specimen we've seen pop up in recent leaks. And just as the leaks also informed us, the Mini hosts a 1.4GHz quad-core Snapdragon processor with 1GB of RAM. The tablet packs a 1280 x 800 display while the phone is offering up a 960 x 540 screen. Meanwhile you'll get 16GB of onboard storage, which can be expanded via the microSD slot. The whole thing is priced at NT$11,990 (about US$405, £246, AU$445). So when can we get it? A spokesperson for Asus told us that a UK release wouldn't happen this year, and right now the Mini has only been confirmed for China, Russia, Indonesia, Singapore, Taiwan and Hong Kong. But Asus told Engadget that it plans to get its PadFone Infinity line over to the US in Q4 2014, so we could well see the Mini break out around the same time.